Please find enclosed the photo of the new modification of the OSA pistol - the PB-4-1 as well as the photo of the earlier PB-4M. Below is the text from the advertisment. 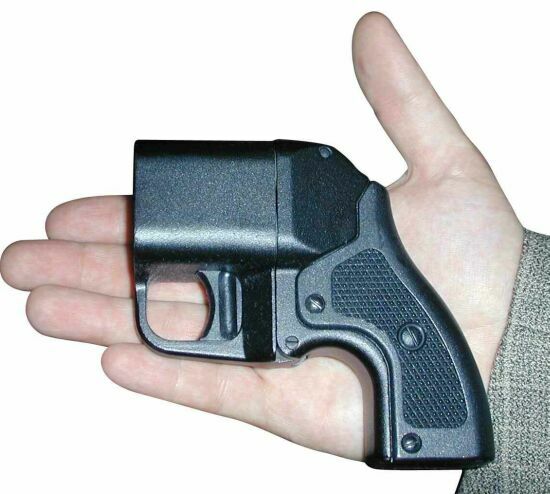 Meet the "OSA" multi-purpose self-defense less-lethal weapon system - the first-ever handgun that can reliably protect you from the assailant while carrying minimal risk of lethal damage to his health. The "OSA" self-defense weapon system is designed and manufactured by the state-owned NIIPH company, one of the leading Russian military contractors. The manufacturer of the "OSA" system is open for cooperation with foreign partners. Specifications of the "OSA" system can be changed within certain limits according to the partner's order. The "OSA" self-defense weapon system consists of the PB-4 four-barreled double-action-only derringer-type pistol and of the wide range of self-defense and special-purposed ammo. ôhere are two main modifications of the PB-4 pistol: PB-4M and PB-4-1. These handguns are unique because of their "intellectual" electronic action. When the trigger is pulled the special chip in the frame of the pistol is activated. Chip of the PB-4-1 is powered by the CR-123A lithium battery, while the PB-4M uses a specially designed compact electromagnetic generator as the power source. When activated, the chip tests ammo, loaded in the pistol. The test is performed in the "ask-response" mode and takes less then a fraction of the second. During that test the chip receives information about the condition of the each of the pistol's four chambers: if there is a cartridge in the chamber and if this cartridge is ready to fire. When the chip finds ready cartridge it sends an electric impulse that ignites the cartridge's electric primer. Such system eases the process of shooting: each trigger pull will cause shooting until there would be any workable cartridges in the pistol. The trigger pull on all PB-4 pistols is 40 H. The electronic action contributes to the reliability of thÅ pistol: there are no reciprocating parts that can jam because of the dirt, defective ammo etc. In the case of misfire the pistol will automatically find and shoot the next working cartridge: there is no need to clear and reload the pistol as is with conventional systems. Electronic action also increases the pistol's safety: until the trigger is pulled there is no way to ignite the primer, and any physical impact on the weapon and/or on the cartridge will not cause shooting. That unique feature eliminates the need in manual safety. Frames of all PB-4-type pistols are made from the high-strength aluminum alloy and are very light and compact. Because of their light weight and compact size the "OSA" pistols are well suited for all-day-long concealed carry. The sighting system of the PB-4-1 consists of the "express"-type mechanical sights and the integrated laser sight. The PB-4M has "express"-type mechanical sights The "OSA" system uses special ammunition with unique electric primers. The main difference from the existing pistol ammunition is that the bullet receives all its energy when traveling in the lengthened case, which acts like a barrel. Because of that feature, all "OSA" pistols are very compact. The lack of the barrel doesn't affect the accuracy of the cartridge that is more then adequate for the self-defense purposes. PB-4M and PB-4-1 pistols shoot special 18x45 ammo. The main modification of the 18x45 cartridge is the 18x45T ("T" is for "Trauma") that shoots the 15.3 mm 11.6 gram rubber projectile with the muzzle velocity of the 120 m/sec and the initial energy of the 85 J. The total weight of the cartridge is 25 grams. The rubber projectile incapacitates the assailant with the impact that makes pain shock with the minimal risk of deep penetrating wounds and lethal damage. At the distance of 10 meters the 18x45T can shoot 150-mm groups. To keep the risk of the lethal damage to the health of the assailant minimal manufacturer recommends to shoot 18x45T cartridges at the distance of no less then 1 meter and to avoid shooting the assailant in the head. Almost four years on the Russian gun market show that the 18x45T cartridge is a powerful self-defense tool that can reliably stop the assailant, and, at the same time, carries less threat to the public safety then conventional ammo. The second version of the 18x45 cartridge is the 18x45SZ flash-bang round. The 18x45SZ cartridge provides a very loud noise (140 Decibels at the range of 1 meter) and an extremely bright flash (up to 5 million Candles at the range of 1 meter) and temporarily blinds the assailant for 5-30 seconds (time of incapacitation depends on the brightness of the background). Meantime because of the 18x45SZ's design the shooter is reliably protected from the consequences of the shot. It should be noted that the developer of the "OSA" system is the leading developer and manufacturer of the flash-bang grenades for the Russian law-enforcement. Two special-purpose cartridges from the 18x45 family are the 18x45S signal round and the 18x45O lightning round. The 18x45S sends a bright (red, yellow or green) rocket to the height of 140 meters. The rocket shines for 5 seconds and is visible from the distance of 2 kilometers in daylight and of 5 kilometers during nighttime. The 18x45O sends a special white-light rocket to the height of 65 meters. The rocket shines for 4 seconds and covers a 100-meter circle with the 100 000 Candle light. The 18x45S signal and 18x45O lightning cartridges considerably increase the capabilities of the "OSA" system, making it a first choice for hunters, outfitters, rescue officers and all those who need a compact repeating signal launcher. 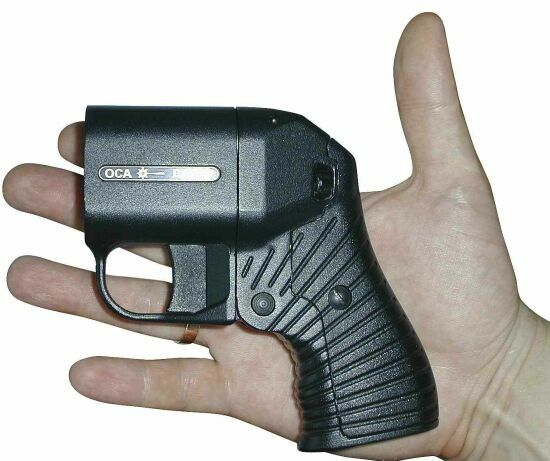 Powerful, reliable, compact and safe, the "OSA" system is the true self-defense weapon of the XXI century, well suited for the needs of law enforcement, security and licensed civilian carry.